The Fijian Competition & Consumer Commission (“FCCC”) jointly with the Ministry for Industry, Trade and Tour­ism recently announced the new Fuel and LPG Products Prices for the second Quarter of 2018 effective from yesterday 15 April 2018. 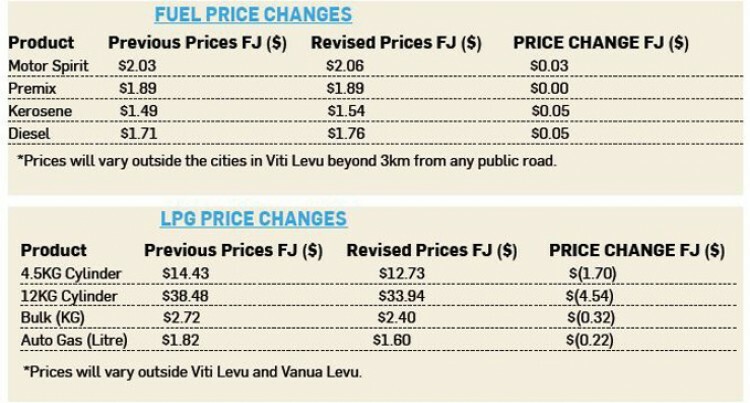 The Fuel and LPG prices in Fiji are reviewed on a quarterly basis and the prices are de­pendent on three key variables factors, the freight rates, exchange rates and the world market prices for refined oil and butane. All petroleum consumers are notified that the retail prices for Motor Spirit, Kerosene and Diesel will increase for this quarter ex­cept for Premix which has a slight reduction by 0.02 per cent at the wholesale level. There was unfavourable movement in the international prices for all the petroleum products since the last quarter. In this quarter, crude oil prices were sup­ported by continuing efforts by Organisa­tion of the Petroleum Exporting Countries (OPEC) and participating non-OPEC produc­ers to reduce production targets which is in effect till the end of 2018 and consecutive weeks of crude inventory draws amongst healthy economic growth and improving oil demand. Geopolitical tensions and a weaker US dol­lar also supported the oil complex. Favourable movement in the exchange rate due to the weakening of the US dollar as well as favourable movement in international freight prices was also noted. The resulting effect of movements has seen the following changes in retail fuel prices for the second quarter of 2018 for the Fijian mar­ket: as per tables. For all LPG product prices, the review pe­riod (January – March) noted decreases in the trading prices and international freight rates while the US dollar weakened resulting in the price decrease. The Saudi CP Butane prices decreased from the previous quarter. It had been observed that increasing pro­duction from US shale oil and gas (LPG is produced as a by-product) had boosted sup­ply of LPG which had put downward pres­sure on prices. The movement in the exchange rate of the Fijian dollar against the US dollar and fa­vourable movement in the international freight rates handling charges also attribut­ed to the decrease in the domestic LPG price. The new prices are effective from April 15, 2018. Wholesale and Retail prices at all other designated centers will change according to their applicable transportation rates. As part of the FCCC’s role in the enforce­ment and compliance, the FCCC would like to remind retailers to ensure the price at which the products are sold do not exceed the maxi­mum prices approved by the FCCC. FCCC, as a proactive measure has inspect­ed stores to ensure compliance to the price changes from the stipulated date. Whilst businesses are in compliance, if members of the public feel the price changes are not being reflected, they are encouraged to raise their concerns with FCCC. This is particularly, regarding prices of LPG products which have decreased. If consumers feel incorrect prices are be­ing charged, they are to contact their nearest FCCC office.